WestJet announced yesterday that it will begin operating daily, year-round service from Nanaimo Airport and Comox Valley Airport to Vancouver International Airport on WestJet Encore. 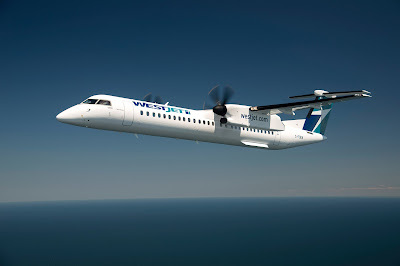 "WestJet is looking forward to providing Nanaimo and Comox with improved connectivity into the broader WestJet network," said Brian Znotins, WestJet Vice-President, Network Planning, Alliances and Corporate Development. "In addition, WestJet Encore's Bombardier Q400s offer an affordable, quick and comfortable option for leisure and business travellers looking to hop back and forth between the island communities and British Columbia's largest business centre and airport." "This is another great connection from our long-standing partner, WestJet," said Craig Richmond, President and CEO, Vancouver Airport Authority. "Thanks to these new services, our passengers will have more options when travelling domestically. This will further grow WestJet's hub out of YVR, connecting people and products to B.C. and beyond." "It's great to see WestJet recognize the opportunity to expand in our marketplace," said Fred Bigelow, CEO at the Comox Valley Airport. "We're well served with WestJet service through Calgary and Edmonton. By adding Vancouver International Airport to the mix, travellers now have more options for easy connections within the Province and Hawaii." "Developing service is key to Nanaimo Airport's continued growth to ensure safe, reliable transportation for Central Vancouver Island residents," said Mike Hooper, President and CEO Nanaimo Airport. "This announcement is a major indicator of how strongly the Mid-Island region is supporting WestJet Encore service." These new routes provide convenient connections to Oahu, Maui, Island of Hawaii, Kauai, Los Angeles, San Francisco, Kelowna, Prince George, Calgary, Edmonton, Winnipeg and Toronto in addition to the direct access that the Vancouver International Airport offers to greater Vancouver area businesses. This winter, WestJet has a total of 505 weekly flights out of Vancouver, 21 weekly flights out of Nanaimo and 36 weekly flights out of Comox, including a weekly flight to Puerto Vallarta.